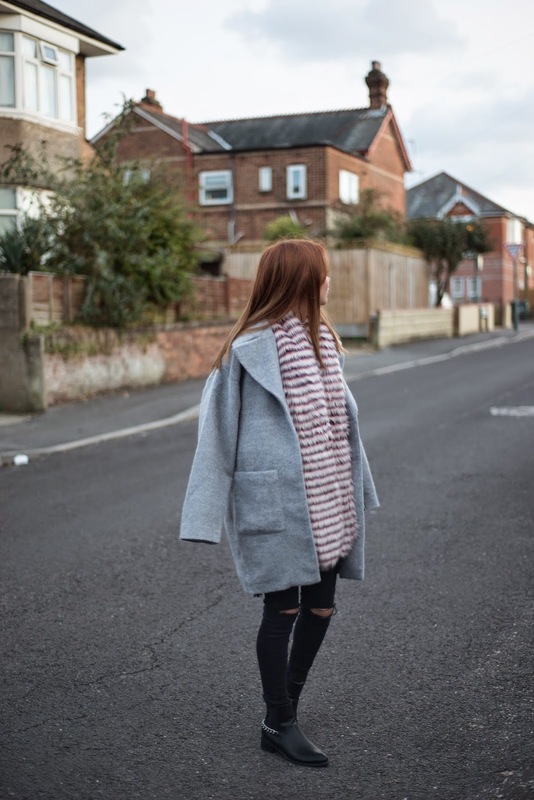 Very different to my last post, this is definitely an everyday outfit, styled with the same coat and bag to show how both can be worn dressed up or down. I was sent this lovely checked top by Red Label and it's a great basic. It's monochrome so goes with everything and it's made of a lovely crepe material that I find is really comfortable. The scallop detailing on the sleeves and hem create a flattering fit and also differentiate it from your everyday plain t shirt. Checks are big for A/W and the brushed stroke effect on this top is really refreshing from the obvious tartan and solid lines. I wore it with my ripped Topshop Jamie jeans which I have worn virtually everyday since purchasing. They are so much softer and easy to wear than my usual Joni jean and the rip just keeps any outfit on trend. I'm definitely converted. Now that the weather's cooling down a lot, I've also been wearing this coat a lot! Because of the neutral grey colour it works well with a lot of Autumnal tones and it's such an easy piece to throw on to keep warm. £39.99 is such a reasonable price for a coat too! Keeping to the monochrome theme, I wore my F&F boots which are yet another item I have been wearing everyday. I cannot describe how comfy they are, which is unexpected because of the low price tag and the pointed toe but I've literally not worn a pair of shoes this comfy for years! My ASOS pony skin bag was the perfect accessory to add a pop to the outfit and pick out the pink and red tones in my scarf and it fits all my essentials in. I love the way I could wear so many different textures in this outfit and it didn't feel over complicated because of the selected colour range. My fave texture has to be the fur from the scarf which has already been seen on so many bloggers because it's just so fun! What's your favourite Autumn / Winter texture?